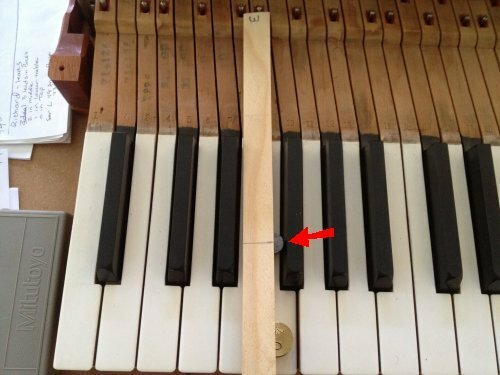 This method assumes that most of your key leads are 1/2"
If not, method adjustment will need to be made (substitute 1/2 with 5/8). Down Weight and Up Weight, recorded, Friction calculated, and Friction issues dealt with and re-measured and re-recorded for Down Weight and Up Weight on corrected notes. 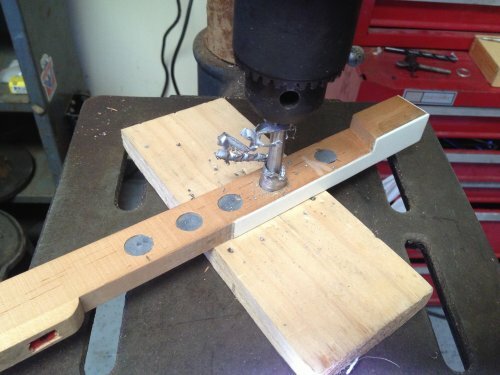 You need a current and accurate downweight for every key before making changes. 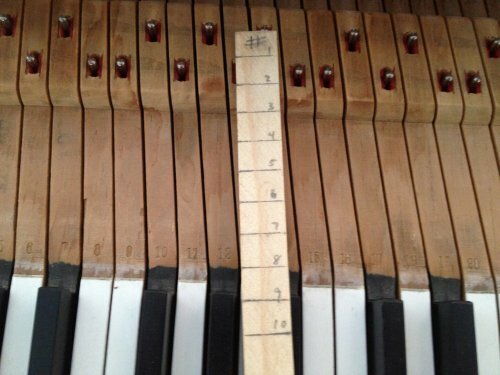 Pick a White Key in the Bass Section that has whatever grams down weight. Then put 10 grams less on that key (in the same position) and move a 1/2" key lead to the point where the key drops in a similar fashion as original starter weight. 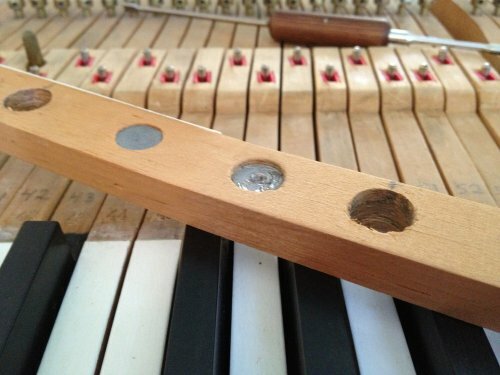 Put a thin flat stick against the White Key Balance Pin and lay it over the the key and make a mark that represents the middle of the 1/2" lead that you placed to cause the key to fall under 10 less grams than the original down weight. 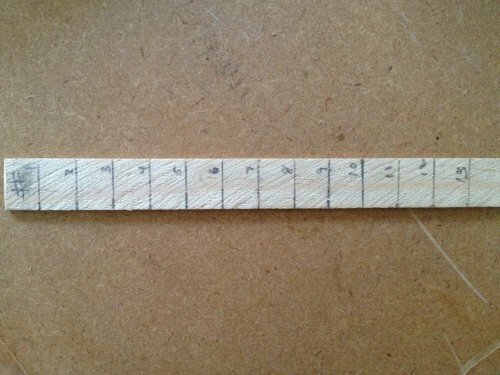 Then measure this mark, divide by 10, and make a line for each 10th. Mark the top of the stick W for White Note. 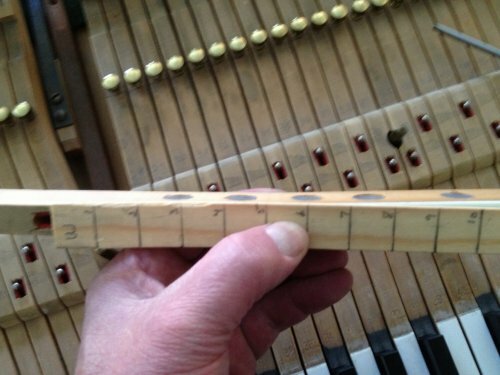 Each line on the above stick now represents a 1 gram influence on the White Key when using 1/2" key leads. 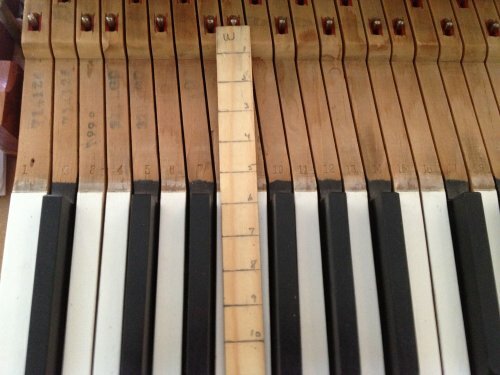 If you remove a 1/2" key lead from beneath the 3 line, down weight will increase 3 grams. 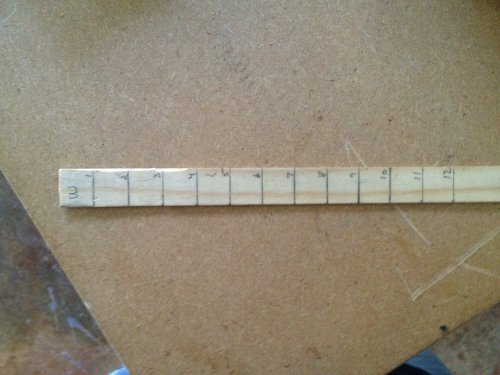 If you add a 1/2" key lead beneath the 3 line, down weight will decrease by 3 grams. Now, flip the stick over, Mark the top #, and repeat the above procedure for a Black Key. 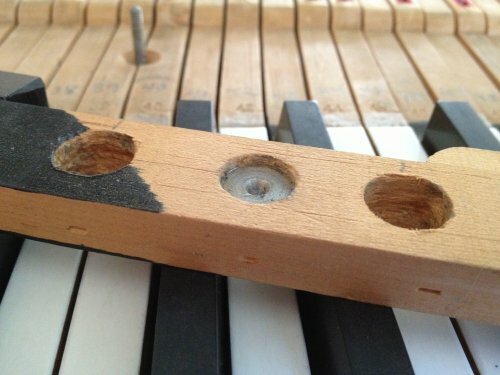 Note: if your keyboard has mixed lead sizes, you could make a stick for each lead size. 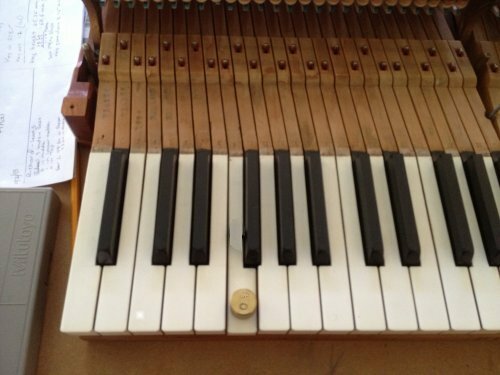 Each line on the stick now represents a 1 gram influence on the Black Key. You may now remove the action stack. Now the fun begins. This is a white key. It might be hard to see but if you want to increase Down Weight by 6 Grams, drill out the lead under the 6 marker line. If you want to increase down weight by 9 Grams, drill out the lead under the 6 Grams and the 3 Grams lines. You can also calculate by halves (4.5+7.5=12 - There is a lead at 4.5 and 7.5). You can also drill out only 1/3, 1/2, or other portion of any given lead to get what you want. Note: We just completed an entire keyboard using this method for the first time and managed a very consistent down weight (+- 1gram). We also removed about 3.8 lbs. of lead from the keyboard. Turns out that we had to extend the key weighting scale stick to 12 grams for the white notes using digital calipers to mark additional lines. Also had to do this for our black keys as well. 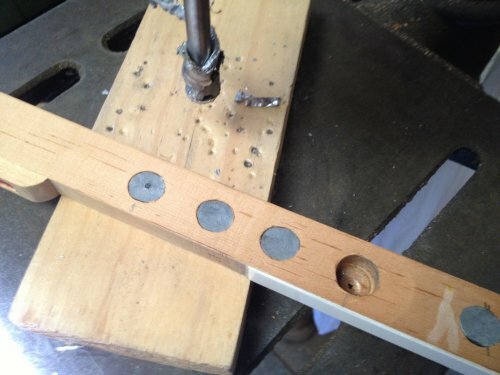 Drilling out lead with a forstner bit. Note: Please use latex gloves and mask when working with lead. Lead on far left will be removed next. Removing only about 1/4 of a lead. Removing only about 1/3 of a lead. This procedure works amazingly well. I believe things could get even smoother by getting more comfortable drilling 1/4, 1/3, 1/2, and 3/4 portions of existing lead. On the flip side, if you end up a downweight that is a little high, it's nothing to add a 1/4" lead somewhere along the key line.